Anytime Zynga releases something new, you can almost guarantee solid adoption. Such is the case with Hanging with Friends, the developer’s follow up for the popular Words with Friends. 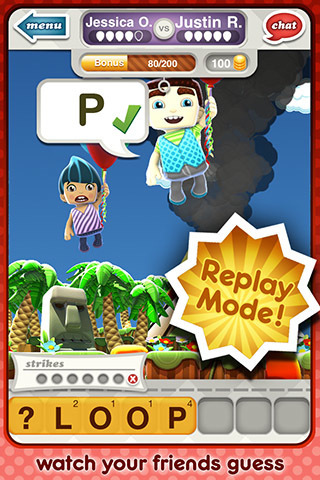 Hanging with Friends pulls users away from the Scrabble board layout into a world of duel-like Hangman feuds where the only thing suspending your avatar over a lava flow is a group of helium filled balloons. Players take turns creating words with the twelve random letters they’ve been given in a drag and drop fashion. After a word is created your opponent receives a push notification telling them it’s time to take a stab at the secret word. When you’re opponent opens Hanging with Friends on the other end, the app updates and it’s their turn to guess the word you’ve provided. 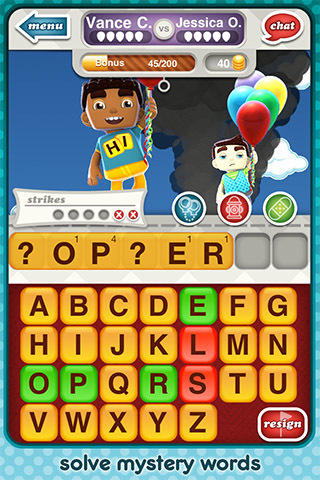 Players pick any letter from A to Z to take a guess at whether that specific letter is in the word. Pin down the right letter and the letter box changes to green and that letter appears at its proper spot in the word. Get the letter wrong though, and that letter lights up red and a strike appears in the form of a red x. Fail to guess the correct word in the allotted number of strikes and you lose a balloon and start to sink closer toward the lava. When you start to sink your happy avatar’s expression becomes fearful, but because there are only eight avatars to choose from, frequent players will start to run into the same animations repeatedly. When the turn shifts your opponent can replay your turn to see your guesses, but this process tends to drag on to the point where viewing the journey doesn’t offer much appeal. Fortunately it’s easy to jump past the turn replay by pressing skip and jumping into the word creation mode. Players who create words out of less frequently used letters (like X or Z for example) earn more points, but there’s also a Scrabble-like element that lets players earn Triple Words or Double Letters by putting their created word over the respective TW and DL tiles. Points earned through word creation then become coins, which can be used in the store to purchase more lifelines, but with the way Zynga monetizes, you can almost guarantee that there will be more ways to spend your coins in later editions of Hanging with Friends. 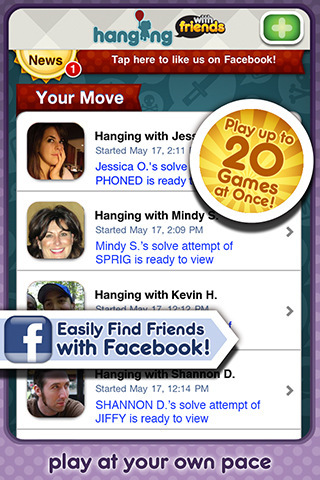 Like anything else Zynga, Hanging with Friends is tightly integrated into Facebook and Twitter. You can see who of your friends or followers also has the games and challenge them to a match, or just wait for a random opponent to join you. Gamers can play up to 20 games at a time, which adds a bit of intensity to the casual move whenever you want appeal, but getting games to load correctly can be a challenge, and in some cases my opponent showed me instances where the word they were guessing wasn’t even showing up on the screen during their turn. Zynga made up for the issues early adopters had with an unprompted apology and 100 free coins, which I thought was nice, but even when the game works well, the fancy graphics and sound effects don’t feel like enough to get players hooked. Of course I’m sure many would disagree, but sometimes the good old fashioned version of Hangman is more fun than a heavily animated game filled flooded with features. 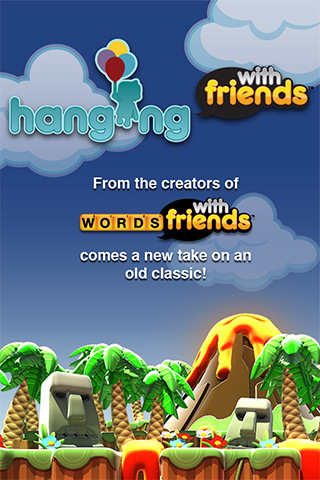 Bottom Line: Hanging with Friends is a Hangman knockoff by Zynga that attempts to follow in the footsteps of Words with Friends. While the attempt is valiant, I wouldn’t worry about downloading this one too quickly.